6–3 had the height to see the whole court. What Butch lacked in natural ability he more than made up for with relentless hustle, anticipation, and a keen understanding of the game. These same skills made him a terrific soccer player. Butch enlisted in the Marines during World War II. After being discharged he enrolled at Princeton University, where he became captain of the soccer and basketball teams. The academics proved a greater challenge, and in 1946 he decided to leave school and try his hand at pro basketball. A new league, the Basketball Association of America had formed and placed a team across the Hudson River called the Knickerbockers. Butch played sparingly as a pro. At the age of 27, he left the Knicks and began a coaching odyssey that would take him to 13 different cities. Wherever, he was working the sidelines, Butch was hard to miss. He badgered the refs, screamed at his players, and abused courtside furniture. “Animated” was a word often used to describe him in the press. He began with Lafayette in 1951, moving on to Hofstra in 1955 and Princeton in 1962. His first pro job was with the Lakers. 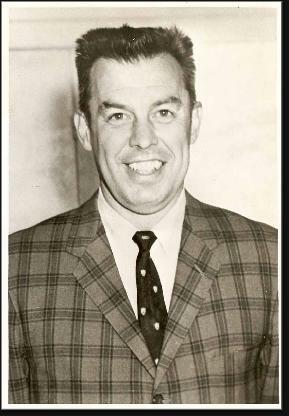 He also coached the Pistons, Suns and was the first coach of the New Orleans Jazz. Butch also put in a year with Memphis in the ABA. In 1977, Butch returned to the college ranks with the University of New Orleans. In the late-70s he also coached the New Orleans franchise in the Women’s Professional Basketball League. Butch concluded his career with stints at old stomping grounds Lafayette and Hofstra. He retired in 1994, at the age of 71. In his final season, Hofstra lost 14 of its 15 games—and then rebounded to win the conference tournament in double-overtime. It was Butch’s 483rd victory as a college coach. Nothing drove Butch crazier than a great player who failed to match his talent with the kind of unrelenting passion he possessed. When he had Bill Bradley at Princeton, he always felt he could have been better. The same was true of Wilt Chamberlain when he coached the Lakers. Butch may be best remembered for benching Chamberlain in the final minutes of Game 7 of the 1969 NBA Finals. In actuality, Chamberlain benched himself after tweaking a knee. Butch never put him back in. He felt the only time a player like Wilt should come out of a Game 7 was on a slab. The decision cost Butch his job. Butch’s son, Jan, was a superb college player for Vanderbilt in the early 1970s and played pro ball for 9 seasons in the ABA and NBA. He returned to Vanderbilt in the 1990s as head coach, and also coached at Cornell, Pepperdine and St. Bonaventure.